Standard has introduced a new (albeit probably remarkably weaker) version of Birthing Pod. Obviously this demands a way to attempt to abuse the ever loving crap out of it with as many creatures that have either ETB or dies effects as you can muster. The fun part is it highly encourages 3-4 colours, as black, red, and white all have useful cards that can slot into the creature ramp up. The cost is having a far more awful mana base. Example of a basic Bant brew. All of these cards have ETB or dies effects in the REQUIRED blue / green colours. These vary in overall usefulness, but some are quite powerful. Black adds some nice recursion effects from the graveyard, ways of sealing / stealing creatures, destruction, and card draw from dying creatures. Bant allows great disruption, ways of digging into your deck to find Vannifar with Militia Bugler, and some great finishers like Lyra. Red adds probably the best 4 drop of the pod recursion, because Rekindling Phoenix can potentially be used multiple times. This card is incredibly useful in this deck. It allows you to dig for Vannifar or any creature you need, and mainboard removal in a pinch. The goto since Ixalan to protect your creatures. Flash in a hexproof against removal. Great sideboard card for G2/3 when you see they are packing sweepers. It has a nice synergy with Incubation Druid as well if you want it a counter so it can tap for 3 mana. Not a Vannifar pod target at all, but with the amount of ramp and consistency in your land drops you can get with the explore package, it can be a powerful finisher that will at minimum draw you cards and gain you some life. Probably the reason to splash red. This allows you to drop Vannifar through counters *and* immediately have her alter your board for the better. You can also pump Vannifar's body up to 5 in certain situations to get yourself out of Lava Coil range. A weaker version of Incubation unless you need the land drops. This is worth considering if you are going 4 colours. I'm not sure she fits that well in the deck, but she should be easy to cast for whatever style of deck you play here, and she does fill a potential hole with her -3. A solid counter that gives you a body / sac target, she isn't a card you want to sac into (If only pod could be done at instant speed, this card would be INSANE). I am not sure if she makes the cut, given how hard it is to cast as well on the curve. I would love to hear if people have success with her in this deck. Great card for ramp that's also a cantrip. I'm not sure this makes the cut in 3 colour decks, but it's worth a mention if you go 4 colours. The key will be to leverage the power of your low drop / ETB effects to stabilize the game until you can get your Vannifar out. We have a few ramp and search cards cards in our deck, so getting her on turn 3 is not necessarily too difficult. Once she can start recursion, tutor for any creature you need to help keep your advantage going, and push up to your biggest threats. Potentially having multiple 5/6 drop creatures happen on the same turn can be very difficult to deal with, and there are loads of answers. This deck is especially weak against Tocatli Honor Guard. This is something that will have to have answers in Game 2/3, as it's probably not going to be in their mainboard. Thankfully, Incubation / Incongruity comes with an answer potentially baked into your mainboard. I think our deck is really strong against Mono red aggro. I would be interested if U-Tempo is a tough matchup. Tocatli wrecks most versions of this decks, because they are trying to maximize the ETB cards. Temur might be okay, as its more straight up stompy, but I think it's still problematic. If you see white, you might want to make sure to have some kind of removal game 2/3 (and if Best of one, include some removal in the main deck, like Incubation). If you're splashing red, this is pretty easy with Lava Coil, Lightning Strike or Banefire. As with most creature decks, sweepers are a huge problem. If using white, Unbreakable Formation will be a great sideboard option. Otherwise, include some counter spells in the sideboard, and try not to over commit. Counterspells, Carnage Tyrant, or Rhythm of the Wild are our best answers. Vannifar sacs get around counters, but it'll be a battle to get her on the board without Rhythm on the board. I personally love the Bant version. I think it gives a lot of utility, but it comes at the cost at having rather weak 4 drop options compared to adding Black or Red. But Deputy of Detention, Militia Bugler, and Knight of Autumn give amazing utility in the 3 drop slot, Shalai, Voice of Plenty helps protect you and your creatures, as well as improving your weaker creatures in the 4 slot, and the 5 slot gives you Lyra Dawnbringer (a great finisher), Lumbering Battlement (You can retrigger your ETB effects AGAIN if it dies or gets exiled. Card has some fun utility in this deck), and Trostani Discordant to help overwhelm them with some of your weaker bodies. But I think you sort of pick your battles, here. If an ideal mana base could be figured out for a 4 splash, you could really just have your pick of the litter. Being able to tutor up any creature card if you get Vannifar online is incredibly useful. Sig made by Tiiratore. PM him if you want one. Disappointing avatar made by Mirror Entity at Disappointing Signets Inc.
UWGDerevi, Empyrial Tactician "you cannot fight the storm"
I think Bant does have slightly better creatures on the splash but I'm all about straight Temur Vannifar now. We don't have the glut of creature removal that Bant does but we do have some options like Ravanger Wurm and (to a lesser extent) Skarrgan Hellkite. But the biggest draw in Temur vs Bant is something that Bant just can't replicate: Rhythm of the Wild and Rekindling Phoenix (and maybe Squee!). Rhythm is such a big draw because it's a much-needed plan B, just Temur Monster beatdown. If you don't have Vannifar or she gets hated out, the deck can still just win games on its own. But with Vannifar it makes sure she A) Can't be countered and B) Has Haste. That's just too perfect for what Pod wants to do. Bant Vannifar has to slam her and pray. Then there's the Phoenix which is so stupidly good on its own and stupidly synergistic that it creates a reliable package that can just out grind most decks. Right now I think Bant still has a better matchup against the aggro decks of the format, and that's something that pushes it to be favored if you're playing Bo1. But for those in paper or MTGO or Bo3 I think Temur will be the varient to beat. Here's my list. Current Commanders: Marath, Will of the Wild, Brago, King Eternal, Kaalia of the Vast, The Ur-Dragon. I run a lot of White apparently. I will try to update some of the supporting cards sometime this weekend. If anyone has good reports on matchups, please post them and I'll update the original post. I think Bant vs Temur is building based on your preference offence or defence. I think the chance of getting Vannifar in Bant is MUCH higher because of Militia Bugler. It's such a good 3 drop, and is a good sac target for the 4 drop range. I think Shalai, Voice of Plenty and Unbreakable Formation along with Dive Down give plenty of good ways of protecting Vannifar and your board in general. I think both are quite successful, though. It'll really depend on your local meta, or matchup. Rhythm of the Wild will make this deck so much better against Control, even if you're still pretty vulnerable to sweepers. I do think a hasted Vannifar turn 5 or so to suddenly cheat in a hasted Carnage Tyrant or something may be game over. Have you had any consistency issues? It seems like you don't have a lot of ways of filtering for your necessary pieces. Vannifar is more vulnerable in your deck without Rhythm of the Wild. Have you had any consistency issues? It seems like you don't have a lot of ways of filtering for your necessary pieces. Vannifar is more vulnerable in your deck without Rhythm of the Wild. [/quote]I think a big difference is that my Temur build doesn't rely on Vannifar so we don't fret about finding her. 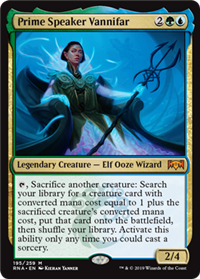 Without her, the deck is still Temur monsters and you can win games without drawing Vannifar or even Rhythm. When you do draw one or both of those pieces though, the deck just explodes and can do crazy amounts of burst damage or just flood the board with powerful midrange threats. The Bant pod list is built to make sure you find and can protect Vannifar, the Temur build just uses Vannifar to go over the top. Edit-I have realized, in the meta, that Deputy of Detention is just SO good and that's something that Temur can't replicate that Bant has. I like my build because it can just win with any combination of threats but the Bant list does have better cheep creatures. I really like the Bant version of the deck. Have you play tested that version much? Don't have my paper copies just yet But it seems like a few folks have been playing the Bant or Temur version on Arena. A couple of the links have been posted in here. I did a minimal amount of playtesting with my Sultai Red version before deciding that it was too greedy and clunky. I threw the following Sultai version together just before Standard. I went 2-1, not counting a bye: bye, Bant Planeswalker Control (win, 2-0), Mardu Planeswalker Control (loss, 2-1) and Simic Climbing Quasi-Oozes (win, 2-1). Deck is unrefined and needs help, but is very fun. In the last gsme we both owned Biogenic Oozes on board. Unfortunately, opponent's Biogenic Ooze had been Hostage Taken and was working for me also. Opponent scooped when Vannifar was at 6/8. Frilled Mystic is not supported by the manabase. I want to add a Journey to Eternity. At least one Hostage Taker should be moved to the sideboard. Forerunners should also probably be in the sideboard. I think I want another Reclamation Sage also. Forcing a single archetype in all formats: too many colors, bad mana. Hello, been playing with Vannifar on MTGA and I find it not op but very entertaining. From my observation, this deck is very good at grinding (grinded through 5 hydroid krasis in one game), therefore I am more focusing on the early game like the old GB Midrange. I am slowly starting do dislike this guy in maindeck. Many times I Vannifar'd him as I did not want to keep loosing life. With Vannifar in play, I can gain so much advantage that he was more hurting me than opponent. I like Dryad more as she keeps generating tokens without any mana spent. if unchecked, it ends the game pretty fast. I dont like it much but its only for mono red. Wiping out elves, viashino pyromancers, healers hawks and Judith tokens deck is gas. Overall I use 1-4drops to control the board and my 5's and 6's ends the game. It's not rare to pod into Izoni and generate like 7-10 tokens and keep mana up. Jeff Hoogland - not a fan of this build and haven't watched the video, so caveat emptor. Edit: A temur list from the latest MTGO 5-0 dump. That deck didn’t even use rhythm of the wild. Or much ETB effects. I dunno, it’s interesting. I feel like that deck doesn’t really care about the combo at all, it mostly just shows off the power of Hydroid Krasis ( which I think is ridiculously good), and Rekindling Phoenix IMO. I wonder if pod adds much to the decks win % at all. I wonder if there’s a need to differentiate the difference between the decks that really push Vannifar as a combo piece vs decks that are just stompy and use her to win harder if they happen to draw her. Not being able to rip her ability as an instant seriously limits what I think of the card. It will take some careful planning to make it worth while. That is why I'm turning from the bant version. I'd rather have the hasting red guys so that I get immediate value from the card I grab. Instant speed would be broken -- even Birthing Pod wasn't instant speed. The difference is, though, there isn't a great way to chain her sacs / go infinite, unlike in Modern. We *do* have a couple cards that allow us to chain it twice in a turn, though. I wonder if that's worth exploring. This is just a dump, some of these are definitely not able to be in the main deck. The best probably is Stony Strength. You guys bring up an excellent issue: is using Vannifar instantly worthwhile? I look forward to this question being answered over her time in Standard and learning for myself. My initial answer is that it isn't worth a card. I currently see Standard as attrition battles. Getting ahead enough to have Vannifar + a creature to sac is a fair setup cost. Adding a card to that seems unreasonable. I want to make a deck that can win without Vannifar. A deck that gets ahead enough to have a chance to win with Vannifar. I don't want to hope to be lucky and stick my combo. I want inevitability. The advantage of using Vannifar instantly is 1 death trigger + 1 ETB effect of the next sized creature if I have a creature out. Is that worthwhile? Many ETB effects aren't worth a card: converting a Llanowar Elf to a Merfolk Branchwalker, for example. I don't want to spend a card for the uncertain payoff. On Monday, I played with three Vannifar. In my last hand, I opened with three Vannifar and kept. I won on the back of Biogenic Ooze, pod in Hostage Taker to take Biogenic Ooze, but I was lucky to win with an effective double-mulligan. Cards seem too important to me. I am currently betting on the Explore creatures to keep me alive against R aggro and have enough time to untap with Vannifar. My dilemma is not whether to run 3 or 4 Vannifar, but rather whether to run 2 or 3. Rhythm seems potentially worthwhile against counterspell decks to make sure creatures resolve, but I'm not sure I would maindeck it if I were running R.
I look forward to the dialogue and learning how wrong I am. PS: SaffronOlive used Cacophodon to untap Vannifar and use her multiple times, just to add to the list. It might be worth putting a link to SaffronOlive's dinosaur combo version in the OP. Edited in. That's a good point, although I'm not a huge fan of Saffron's deck personally. I think that's why I marginally edge towards the Bant version -- with Bugler + Incubation, you can actually focus on the combo, but it's not *inherently* necessary to win. Bugler / Incubation can easily pull up a Hydroid Krasis for the win or tempo, for instance, and the explore package can easily pull games for you on their own. But combining them should allow you to resolve Vannifar more often than not in games. I think this is less true of Black or Red, though, and they want to go more grindy (or smashy I guess it red's case), and Vannifar is just icing on the cake. I think Rhythm of the Wild may be a bit overblown in usefulness outside of the control matchup for Red, though, and not all that reliable, because you have no way to find it in your deck. SaffronOlive, probably better known as SaffronOlive, made a video as he used a rampy Temur Vannifar deck to blow through a Bo1 Constructed Event on Arena. Seems to be of similar thinking to what we've gotten down here. Think he has *wayyy* too much ramp, and I don't really like Sailor of Means in the 3 slot, but definitely works. Do folks generally feel Adventurous Impulse is better than Incubation // Incongruity? It's an interesting question. I am so afraid of whiffing. With 50% creatures, we would whiff 3% of the time with Incubation, but we dig 2 deeper and have the option of Incongruity. With 90% creatures and land, we would whiff 0.1% of the time with Adventurous Impulse, if I calculate correctly. Also relevant is that my one loss on Monday was to Angrath. I have added some answers to planeswalkers since, but Incongruity would help. Bedevil in a Vannifar manabases seems like a fantasy. Other options for digging include Opt, Anticipate, Shimmer, Chart a Course and Riverwise Augur. I agree that I prefer less ramp and Sailor is not that impressive for ETB, even if it blocks pretty well. It's interesting that Temur has the best chance at making use of the Chainwhirler-Status combo, but a manabase that can hardcast Chainwhirler, Vannifar and Statue seems nigh impossible. Chainwhirler stuck in hand just seems miserable. Riverwise Augur and a shuffle could get rid of it. So could Chart a Course. Guildgates, Plaza and Circuitous Route might get there, but it seems like too much work. All these manabases ramblings assume that I need the Explore package to stay alive. If we can run District Guide and some Guildgates, there's a lot more we can do. Edit: Dagger Caster (in Badaboum's deck below) also combos with Status, and is much easier to cast. I agree Hoser2! I think she would best filling a role of a addition rather than building around her. If we had titans or something silly, then it would be worth it. Hi, I'm trying this four colors deck. It is some quite of toolbox deck. Actually it is working quite good for me. Welcome! And a formatted decklist on your first post! That version seems quite intriguing. Can you share some details about how it is working? What decks is it beating? What is it struggling with?